Holly Springs boys have gotten the short end of the stick the last few years. For instance last year they ended the year as the #18 team in NC and #11 team in 4A, but yet again missed out on the state meet due to the brutality of the 4A Mideast Regional. They ended up in 7th last year, two spots out of advancing to the state meet. This season will be no different. A dogfight to get out of the 4A Mideast. 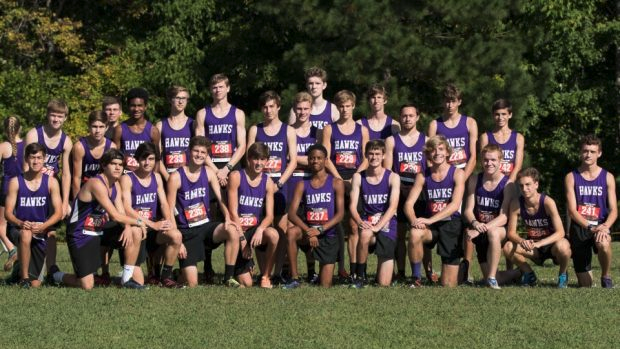 Holly Springs return as the #10 team in 4A, but the #8 team in the Mideast region. The Golden Hawks return 5 of their top 7 from a year ago losing their top 2 in Sam Young and Jevon Neal. Rising senior Ryan O'Hare will be the top man for Holly Springs this fall returning with a 16:46 PR. After running 17:23 as a freshman, it took O'Hare til his junior season to break 17 minutes as he came into peak form just in time for conference and regionals. He had a big year on the track as well running the best 1600 on the team of 4:33 and also 10:09 for the 3200m. He cut off 10 seconds in his 1600m last fall, can he have a breakthrough in cross country and be in the low 16s this fall? Bryan Hill was a surprise for the Golden Eagles last fall as he cut over 2 minutes off his cross country PR ending the year as the teams #4 man at 16:46. As a sophomore Hill's XC PR was 18:47 before his breakthrough as a junior. On the track, Hill posted marks of 2:01 and 4:45 individually. Jackson McIntyre is also coming off a breakthrough season dropping his PR from 18:24 down to 16:48. He continued that success on the track running 4:41 and 2:02. Holly Springs will still need even more out of these two if they want to be at the state meet this November. Brandon Duke also came up big for his team last year dropping roughly 90 seconds off his PR. He ended they ear with a PR of 16:53 improving on his 18:21 PR from his freshman year. However, Duke doesn't run track for Holly Springs. This didn't slow him down last fall, but it's hard to know if he'll come in in top form without running all three seasons. Thomas Durand also will return from last years top 7 with a PR of 17:10. Similar to most of their top 7 last year was a big year for him. He'd only broken 19 minutes twice in his first two XC seasons. He'll look to get under 16 minutes and fight for a top 5 spot this fall. This will be a tough top 7 to make with other strong runners in Adam Kanning, who ran 4:47 on the track, Garrett Hageman, Jake Holmes, Dylan Jarrell, Daniel Redfield and Ben Goetsch who were all under 5 minutes on the track. This team could push close to having 10 boys under 17 minutes this fall if they can follow the same improvement as last year. But they're going to need a little extra firepower amongst their top runners to compete with the elite teams in the 4A Mideast this fall. But things are certainly on the rise for this program.